The National Weather Service issued a red flag warning for northern Virginia and the D.C. Metro area from 9 a.m. to 8 p.m. There is a high risk of fire danger today due to very dry conditions and some gusty winds stronger than 40 mph. A brush fire spread to a two-story commercial building in the 600 block of Rhode Island Avenue NE in D.C. Monday morning. Employees were evacuated. No injuries were reported. The fire danger will diminish after sunset, as winds will be weaker overnight. Tomorrow we will have another fire danger day with gusty winds and dry conditions again. Expect a red flag watch with gusts not quite as strong as Monday's. All citizens should be very careful igniting any flames and should avoid it entirely if possible. 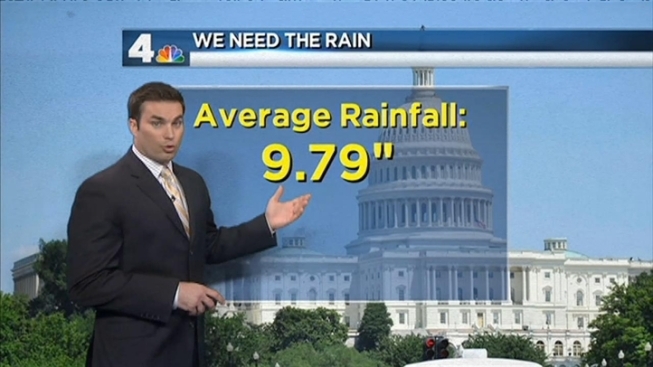 Usually we get 9.79 inches of rain by this time of year, but we have had only 5.69 inches so far in 2012.